Designed for those who need a 24 start system and cant find the room to install a second battery. Tiger Racing has just what you need. 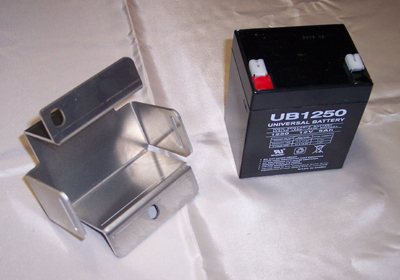 This custom tray fits a UB1250 5.0AH Battery. You get a Battery Box and 1" wide Velcro strap for a secure mount. Mounts on existing holes on right side of sub frame. Mounting Bolts and Battery not included.